Discerning one duck breed from another is often challenging for beginners; when the ducks in question are hatchlings, the task can be nearly impossible. In many cases, positive identification is only possible once the bird matures. 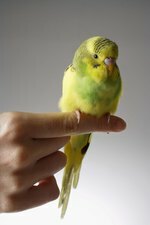 However, you can consider a few characteristics that may indicate to which breed the bird belongs. A group of mallard ducks swimming in lake. A Pekin duck laying beside a lake. Pekin ducks are the most commonly kept duck breed. They provide 95 percent of the duck meat consumed in the United States. Pekin ducks match the mental image most people have when they envision a hatchling; the young ducks are covered in yellow feathers, and have orange beaks and feet. However, some individuals bear patches of dark color that eventually will fade as the animals lighten. Like wild mallards, male Pekin ducks have a clump of curly feathers near the tail. 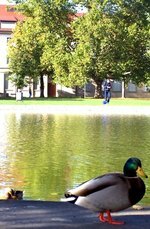 Two Muscovy ducks standing beside lake. Muscovy ducks are the only domestic duck breed that does not descend from mallards (Anas platyrhynchos). Instead, they represent a different duck species, called Cairina moschata. Unfortunately, while mature Muscovy ducks are easy to distinguish from mallard-derived breeds by observing their abundant facial skin and bulkier build, the hatchlings are difficult to distinguish from wild mallards, Pekin ducks or other breeds. Further complicating matters, the breed exhibits a number of color mutations, which can produce ducklings clad in yellow feathers, brown feathers or a combination of both. Additionally, depending on which color mutations, if any, are present in the animal, Muscovies may have brown, black, gray, pink or orange beaks. Two Indian runner ducks standing on dirt. Indian runner ducks are the easiest duckling breed to identify, as their posture differs from that of most other ducks. This is fortunate, as runner ducks occur in a wide variety of colors and patterns. Unlike most other breeds, which hold their bodies at an approximately 45-degree angle, runner ducks hold their bodies more vertically, which gives them a penguinlike appearance. Although they are not a true breed in the strictest sense of the word, many people keep wild-type mallards, rather than their domestic descendants. Because they must avoid drawing the attention of predators, hatchling mallards are often clad in a combination of yellow and dark brown feathers, which help to break up their outline, thereby allowing them to blend in with their surroundings. Wild-type mallards usually have a dark line that passes through their eye; their beaks are usually rather dark, although yellow and red areas are occasionally present.